LONDON, April 14 (Xinhua) -- Although the British government on Saturday defended its decision to join the U.S.-led military strikes on Syria without consulting Parliament first, British opinion leaders immediately questioned about the Whitehall's legal justification of such a military action. Shortly after the military strikes were launched, Scotland's first minister Nicola Sturgeon said UK foreign policy should be set by Parliament and not Donald Trump after the U.S., UK and France bombed targets in Syria. Sturgeon said the suspected use of chemical weapons was "sickening", but warned that the latest action risked "dangerous escalation." Meanwhile, Britain's main opposition Labour leader Jeremy Corbyn described the U.S.-led military strikes on Syria jointly staged by three leading Western countries as a "legally questionable action," saying that the British government should "not taking instructions from Washington." Earlier Saturday, British Prime Minister Theresa May said that she has authorised the UK armed forces to conduct "coordinated and targeted strikes" in response to alleged chemical weapons attack in the Syrian town of Douma earlier this month. Speaking in Downing Street, May said the military strikes should be a "warning to Russia" before holding the Syrian government accountable for the chemical attack. However, May is facing questions over the legality of committing UK forces to any U.S.-led attack on Syria. The opposition leader questioned the prime minister's statement that the Syria attack is "right and legal." "Theresa May should have sought parliamentary approval, not trailed after Donald Trump," Corbyn said. "Bombs won't save lives or bring about peace. This legally questionable action risks escalating further." "The government should do whatever possible to push Russia and the United States to agree to an independent UN-led investigation of last weekend's horrific chemical weapons attack so that those responsible can be held to account," he added. For his part, the leader of the UK Independence Party (UKIP), Gerard Batten, opposed the British military action in Syria. He warned that intervention would lead to a proxy war with Russia which would be "not only dangerous to Britain, but the entire world." The joint attack by the United States, Britain, and France, which began at 3:55 a.m. local time (0055 GMT), launched some 110 missiles targeting Syrian military sites in the Syrian capital Damascus and elsewhere, Syria's state news agency SANA said, citing the military. "There is no proof that the Assad regime is responsible for the chemical attack on civilians," Batten said, referring to the Syrian government headed by Syrian President Bashar al-Assad. 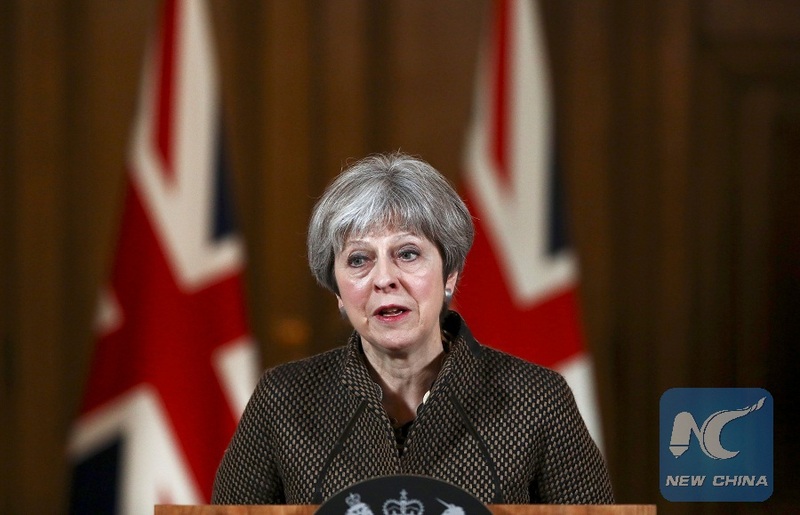 Questions were also raised to May at her press conference at 10 Downing Street, which came just hours after the launch of the joint military attack, as to why her government did not first ask for the approval from the British Parliament and the authorisation by the UN Security Council. Correspondents from the British and world press also asked the prime minister to explain what role can the Parliament play in making a decision to attack another sovereign country. Under the UN Charter, the United Nations has the primary responsibility for maintaining international peace and security. Meanwhile, Former Royal Artillery officer General Sir Richard Barrons, writing a commentary carried by the Times newspaper, warned the strikes may come at a cost. "We should not be surprised if we detect major intrusions into U.S., UK and French cyberspace and social media," Barrons said. "These risks are a feature of modern confrontation." "There is also the question as to how this use of force will be linked and subordinated to strategies for bringing the fighting in Syria to a rapid end and for resetting relations between the West and Russia," he said in the commentary. Professor Iain Begg, Research Fellow at the European Institute and Co-Director of the Dahrendorf Forum at the London School of Economics and Political Science (LSE), told Xinhua: "A volley of bombs may help the U.S. and its allies feel they have reacted in a timely and proportionate manner to the undoubted horror of the use by the Syrian regime of chemical weapons, but the inevitable worry will be that they have not thought through what happens next."